U.S. intelligence agencies have linked the company to both the Chinese military and civilian intelligence services and the Justice Department is now seeking to prosecute the company's chief financial officer, Meng Wanzhou, for violating American sanctions law. However, privately officials acknowledge the targeting of Huawei is part of a larger campaign applying pressure on Beijing on several fronts. In addition to prosecuting Huawei, the administration in December indicted nine Chinese nationals for their role in a major cyber economic espionage operation against American companies. Canadian authorities arrested Meng at the request of the Justice Department, triggering a diplomatic dispute that prompted China to detain 13 Canadians who are being held on various charges. Beijing upped the ante in a bid to force the Canadian government to release Meng, announcing this week that it has imposed a death sentence on a Canadian national for allegedly taking part in international drug trafficking conspiracy. Federal prosecutors in the Eastern District of New York issued an arrest warrant for Meng in August, following an investigation into several banks involved in financial transactions with Iran. An FBI criminal complaint in the Meng case remains under seal. A Justice Department spokesman declined to comment. However, an outline of the government's case against Meng and Huawei was revealed in a U.S. extradition request made to the Supreme Court of British Columbia. The document reveals that in one case, an international bank and its U.S. subsidiary transferred more than $100 million through a Huawei front company called Skycom between 2010 and 2014. The Iranian bank involved in the fund transfers was not identified. However, a likely candidate is the Iran Export Bank, which is on the Treasury Department list of institutions barred from any financial transactions involving the international banking system. The extradition request stated that Meng made numerous false statements to a bank claiming Huawei had no formal ties to Skycom. Details of the false statements were outlined in the Canadian court papers, including conversations between Meng and several bankers, along with a description of a PowerPoint presentation from Huawei stating that the company no longer owned Skycom and that Meng had left Skycom's board of directors. "The misrepresentations personally made by Meng were part of a broader conspiracy to misrepresent the relationship between Huawei and Skycom," the court document states. Other Huawei employees made similar false statements to a bank that was not identified, along with three other unidentified financial institutions. Huawei learned of the federal criminal probe around April 2017 when a grand jury issued subpoenas to Huawei's American subsidiaries regarding its Iran business. As a result, Huawei executives, including Meng, halted all travel to the United States, the document says. China has denied Meng or Huawei—an ostensibly private company, but one with close ties to the Chinese Communist Party-ruled government—did anything wrong. Chinese state media, however, have not hidden fact that the detention of 13 Canadians, including a former diplomat, was retaliation for Meng's arrest. She was released on bail Dec. 11. Her extradition could take up to two years, based on similar past cases. Both the State Department and Canadian government issued travel warnings as a result of the detentions. The Huawei employee was identified as Wang Weijing, a former government official once posted to the Chinese consulate in Gdansk, Poland, who joined Huawei in 2011. The second person arrested was identified only as Piotr D., a Polish national and former officer of the Poland internal security service. China denounced the arrests. Foreign Ministry spokeswoman Hua Chunying said in Beijing: "We urge relevant parties to cease the groundless fabrications and unreasonable restrictions toward Huawei and other Chinese companies, and create a fair, good, and just environment for mutual investment and normal cooperation by both sides' companies." Guo Wengui, an exiled Chinese businessman with knowledge of the inner workings of the Chinese system, said Huawei is "100 percent" a government-controlled company masquerading as a private business. The company has close ties to Chinese military intelligence and the Ministry of State Security (MSS), the civilian intelligence service, he said. Guo said in an interview that Huawei was founded by former People's Liberation Army (PLA) officer Ren Zhengfei, and that several family members, including his daughter Meng, hold leadership positions in the company. All are Communist Party of China members. Huawei is controlled secretly by a faction within the Communist Party of China headed by former leader Jiang Zemin, and his son, Jiang Mianheng, president of the ShanghaiTech University. Jiang Mianheng is one of China's most powerful technology leaders who has links to numerous companies, including Huawei, Guo said. "Huawei works closely with the MSS and 2PLA," Guo said, using one acronym for Chinese military intelligence. Financially, however, most profits from the company go to Chinese Party officials involved in the technology industry, he added. The FBI stated in a briefing for corporate security officials last year on the Chinese telecommunications industry that Huawei and a rival telecommunications company, ZTE, are privately held companies but dependent on government for both resources and funding. Huawei was labeled a Chinese "national champion" by the government. The official designation is used for state-owned entities and signifies that the conglomerate, which produces routers, cell phones, and other equipment, is a key element in Beijing's state-directed economic policies including the acquisition of foreign technology. Huawei is currently focusing on developing high-performance computers and cloud computing. The FBI briefing said Huawei and ZTE engage in economic espionage for Beijing and noted that ZTE in the past was sanctioned for illicit dealings with Iran and North Korea. 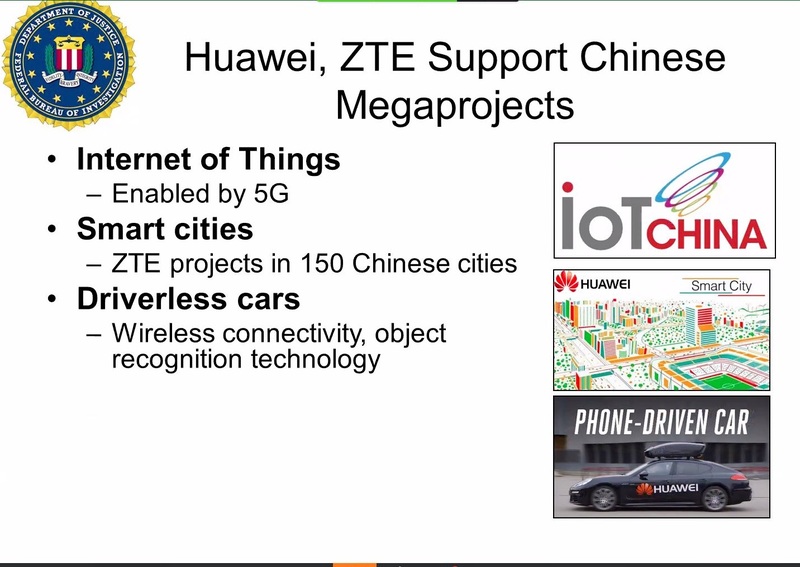 In the industry presentation, the FBI stated that China's government uses Huawei and ZTE to advance national objectives. Those objectives include assisting Chinese intelligence and security services in the massive domestic electronic surveillance programs targeting Chinese citizens. The companies also are part of foreign influence operations aimed at reducing foreign resistance to China's drive for global supremacy. The two telecom companies also are engaged in boosting China's economic growth by competing directly with the United States in leading development for 5G advance telecommunications technology and artificial intelligence, the FBI said. Additionally, Huawei is one of China's leaders in supporting several "megaprojects"—including an effort to control the emerging Internet of Things, the vaguely defined network of millions of internet-linked devices. A second megaproject is developing "smart cities" of wired communities that will facilitate greater Chinese government and Communist Party control. The FBI briefing questioned whether Huawei or ZTE will be successful and noted concerns about industrial inefficiencies, pervasive Communist Party corruption, and weak corporate accounting and oversight. "Foreign suspicion of Chinese companies is growing," the FBI stated. Huawei's founder and president Ren this week called in reporters in Shenzhen, China, as part of the push to seek the release of his daughter. He asserted Huawei does not spy for China and denied Huawei is obliged under a recent national security law to build back doors into equipment that would allow electronic intelligence gathering. "No law requires any company in China to install mandatory back doors," he said. Ren was a former PLA officer once in charge of the PLA General Staff Department of Information Engineering Academy, part of the electronic warfare unit known as the Fourth Department, or 4PLA. Treasury Secretary Steven Mnuchin said Dec. 20 on Fox Business Channel that the Meng case is unrelated to the U.S.-China trade dispute. "The DOJ action is separate from the trade discussions just as the Huawei discussion is separate," Mnuchin said. The secretary added that "we are clearly very focused on making sure that we protect American technology, and this will be a separate dialogue, but something that's important to resolve." Huawei has been long known to U.S. intelligence agencies since the early 2010s for ties to the People's Liberation Army and the Ministry of State Security (MSS). One source of information about the links was revealed in documents leaked by renegade National Security Agency contractor Edward Snowden. One top-secret NSA slide stated that many NSA foreign spying target communicate using Huawei's routers and other telecommunications gear in several countries. The access allowed NSA to conduct electronic eavesdropping on a number of foreign targets. "There is also concern that Huawei's widespread infrastructure will provide the PRC with SIGINT capabilities and enable them to perform denial of service type attacks," the NSA said. The slide quoted from a National Intelligence Estimate from 2010 that warned: "the increasing role of international companies and foreign individuals in U.S. information technology supply chains and services will increase the potential for persistent, stealthy subversions." Huawei also has worked closely with a Chinese cyber security company called the Guangzhou Bo Yu Information Technology Co., known as Boyusec. Three Boyusec employees were indicted by a federal grand jury in November 2017 for cyber attacks on three companies, including two American firms. In 2014, U.S. intelligence agencies reported internally that Huawei had compromised a U.S. router company by hacking details of the company's key software. Huawei also has exploited temporary U.S. education visas by sending hundreds of software engineers to the United States, including some who work for Huawei. Huawei is the world's largest telecommunications company and made reported profits of $7 billion on $19 billion in revenue. China expert Gordon Chang said Huawei is the core of China's plans to dominate the 5G telecom market that will provide high-speed telecommunications in the near future. "Huawei has had a free ride for decades," Chang said. "Washington did nothing to stop its theft of U.S. intellectual property, or its other criminal activity, such as its blatant violation of Iran sanctions." Chang urged the Trump administration and Congress to recognize Huawei as a "criminal enterprise" and enforce laws to counter its activities. "The Trump administration should ban the importation into the U.S. of products that have benefitted from the theft of U.S. intellectual property, or which are sold by companies that have stolen our IP. That, of course, hits Huawei from two directions," he said. Chang said the administration generously lifted sanctions on ZTE last year. "There should be no shows of leniency for Huawei," he said. 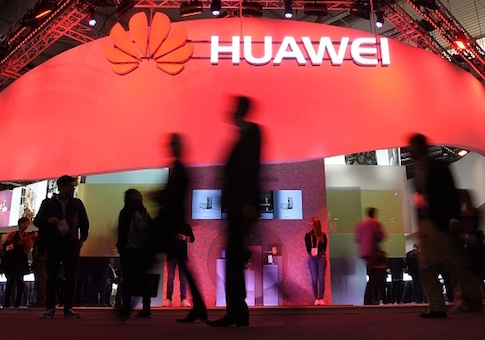 Ed Timperlake, a former Pentagon technology official and editor of the defense newsletter Second Line of Defense, said Huawei has a history of violating sanctions, including those imposed by the United Nations against Iraq in the early 2000s. "Huawei in my professional judgement is an ongoing criminal enterprise using denial and deception techniques and a lot of money and influence to infiltrate their high-tech products into American and global communication networks," Timperlake said. Timperlake urged the next defense secretary to be extremely vigilant toward the threat of Huawei infiltrating technology into Pentagon high-tech systems, including the $10 billion contract awarded to Amazon for a "Combat Cloud" initiative. Rick Fisher, a China security analyst with the International Assessment and Strategy Center, said the public needs to be aware that Huawei's claim to be a private company is fiction. "By Chinese law and regulation, all Chinese companies must obey the Chinese Communist Party and host CCP cells which both report to and take direction from the ‘center,'" Fisher said. "Huawei was founded with the aid and encouragement of the People's Liberation Army and has demonstrated time and again that it serves China's military and espionage objectives," he added. The Pentagon is banned under a recent law from using any Huawei products over concerns the equipment is rigged to permit remote electronic spying by China's Ministry of State Security or PLA Strategic Support Force, that conduct electronic intelligence gathering. Several other nations have banned Huawei products as well. Meng is the daughter of Huawei's founder Ren Zhengfei, a former People's Liberation Army officer. She joined Huawei in 1993 and graduated from the Huazhong University of Science and Technology in 1998. Her husband, Xu Wenwei, is a senior Huawei sales executive. In addition to being Huawei CFO, Meng is also deputy chair of the board of directors. Reports in China say Ren has been grooming her to take over the company. The congressional U.S.-China Economic and Security Review Commission has reported extensively on security issues posed by Huawei. For example, the commission stated in one report that "Huawei's contract with Iran's state-controlled mobile phone industry appears to have been marketed in part on the premise that the company could enable Tehran to censor and conduct surveillance on Iranian mobile phone users." Huawei has done extensive business in Iran for more than a decade. The company has supplied products to several phone companies, including the government-linked MTN Irancell, the Mobile Communications Company of Iran (MCI), the Telecommunication Company of Iran, Telecommunications Infrastructure Company of Iran, and the Mobile Telecommunication Company of Esfahan. A 2011 report by the CIA-based Open Source Center in 2011 identified then-Huawei Chairwoman Sun Yafang as linked to the MSS. Huawei technicians also have trained PLA communications units as far back as 2005, according to PLA media outlets. The case against Meng was based in part on Reuters reports in 2012 and 2013 linking Huawei, Skycom, and Meng to Iran telecom deals. Former NSA and CIA director Michael Hayden told an Australian newspaper in 2013 that U.S. intelligence agencies had evidence linking Huawei to Chinese intelligence. Hayden stated that Huawei "shared with the Chinese state intimate and extensive knowledge of the foreign telecommunications systems it is involved with." This entry was posted in National Security and tagged China, Department of Justice, Huawei. Bookmark the permalink.